Aquascape Clean for Ponds makes it easy to quickly optimize the quality and clarity of pond water while drastically reducing filter maintenance, keeping ponds clean, clear, and beautiful. 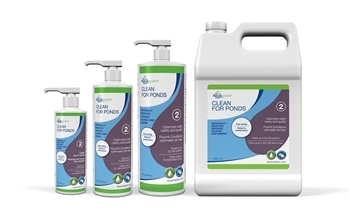 Clean for Ponds uses a powerful blend of heterotrophic bacteria to naturally digest organic waste or sludge caused by uneaten fish food, fish waste, and decomposing leaves and debris. The high concentration of bacteria will work to clean between rocks and gravel while keeping pond filters clean, including filter mats and biological filter media. Clean for Ponds is safe for fish, plants, pets, and wildlife. Aquascape is passionate about the products we produce, providing unique products, designs and features that stand above the competition.